This year’s Oscars will be more than just the annual blessed end to an increasingly protracted awards-giving season—it’s being pitched as “a trip through Hollywood history,” enabled by an ambitious plan to do away with traditional sets and replace them with virtual reality projections. “We're using our environment to take us to different places, different times, and [the look] will change dramatically,” producer Don Mischer tells The Hollywood Reporter, while fellow producer Bruce Cohen adds that, for example, the presentation of the awards for animation would take place inside a fully animated environment, and that various scenic transitions would involve “a scene from a film” or specific times, places, or genres. But even though they’re turning the Oscars into some sort of futuristic Holodeck acid-trip that will probably suffer a lot of “CNN on Election Night”-style criticism the next day, the good news is they’ve made room for all this digital gimmickry by dropping two of the Oscars’ biggest time-killers—namely that recently added thing where five different presenters come out and gush about how awesome the best acting nominees are, and those interminable montages of “Salute to Scenes of People Using a Typewriter” or whatever. In exchange for that, they can conjure up all the green-screens they want. 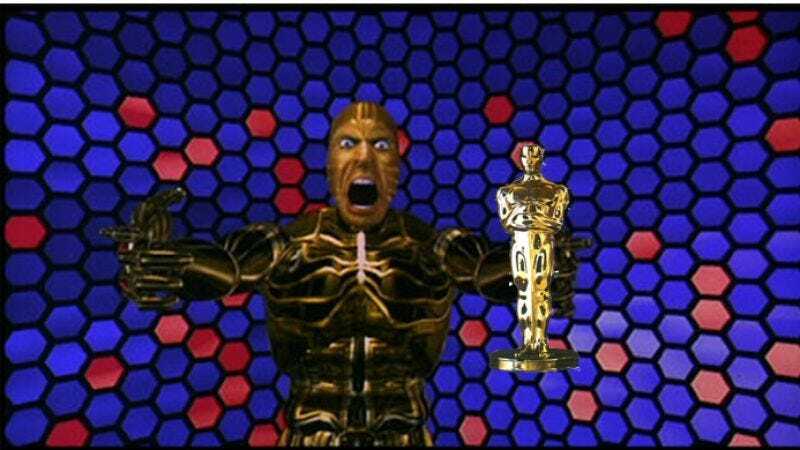 They can set the entire ceremony inside scenes from The Lawnmower Man, just no more montages. Along the way, Cohen said hosts James Franco and Anne Hathaway would essentially act as guides who “take the audience on this journey of a show that will hopefully start in one place, and if it all goes according to plan, it will take you back to where we started at the end." Hopefully they’ll have some blankets and vitamin C waiting for you, because it sounds as though the Oscars are going to be like a trip through the mind’s eye, man. Start softening up your cortex.